The answer? With a fool-proof action plan. Like any New Year’s Resolution, action plans are a big part of the cycle of improvement. For employee engagement, this means writing out your strategy and forming it around all of the people analytics at your disposal. What are your employees saying about your engagement process? Your onboarding process? Now is the time to take your ideas and make them a reality, and questions like these are the stepping stones to establishing your ideal action plan. Your people analytics are the foundation-building bricks your strategy needs to create a viable action plan. But the truth is understanding that data and how to best apply it can be a major pain-point for all businesses, no matter the size of the workforce. The real challenge here is not only understanding the full scope of what your people analytics can do, but how to apply and execute them as action items. How do we maximize our employee feedback and people analytics? What should our measurement focus be? What are our engagement surveys showing us about our current process? How do we organize to-do’s and follow-up actions? What issues/areas of improvement do we tackle first? Lesson number one: You can't optimize what you don't measure, but more than that, you need to know to measure to accurately meet whatever your engagement needs are. Engagement surveys in today's world aren’t enough. While they are an important first step in collecting relevant data, we must involve other innovative ways of collecting feedback to properly measure it. This means adding additional tools like lifecycle surveys, pulse polls, and employee voice to your data-based strategies. Lesson number one: You can't optimize what you don't measure, but more than that, you need to know what to measure to accurately meet whatever your engagement needs are. Engagement surveys in today's world aren’t enough. While they are an important first step in collecting relevant data, we must involve other innovative ways of collecting feedback to properly measure it. This means adding additional tools like lifecycle surveys, pulse polls, and employee voice to your data-based strategies. What feedback are you receiving from employees, whether positive or negative? What are your leaking buckets (areas where engagement strategies bounce or just don’t work)? What business processes, departments or culture elements need the most improvement? How can we improve fairness and equality across our business with regards to 360-degree feedback? Choose questions you are trying to answer first and segment your data that way. Not only will you be able to better understand how your employees think, react and behave, but you will also be able to task action items out on a need-based schedule. It’s a great window for observing the scope of your 2019 goals so you can knock out quick wins first before tackling more long-term engagement improvement. Meaningful Work – making sure jobs are meaningful, people have the tools and autonomy to succeed, and that we select the right people for the right job. Supportive Management – Strategizing and improving upon the daily, weekly and monthly activities managers use to guide, support and align their people. Fantastic Environment – providing employees with a flexible, humane, inclusive and supportive work environment. Growth Opportunity – building opportunities for employee growth and development in their chosen role or career. Strategic insights (AKA your people analytics) are an essential part of the decision-making process. They provide the evidence to solidify your improvement plan and offer the major stakeholders and employees of your organization the foundation of proof that your action plan is employee-facing. After all, you’re doing this because you care about the engagement of your workforce! If you’re listening to employee feedback with the intent of doing, and analyzing their survey responses (among other metrics) to weave them into your strategy, having the pertinent data to substantiate your claim will help executives buy into any changes or new tools to execute your plan. A sound research and data-backed strategy is the backbone to any successful process. Motivation – with 360-degree, real-time feedback, focus on how the team, not just your employees, is talking about, looking at and receiving your current engagement process and the new ideas on how to improve. Motivate achievements and goals with open and receptive communication. Inspiration – use the lens of inspiration to drive your strategic insight. How can your people data be used to inspire further engagement change in your organization? What ways can it be used to drive innovation? Curiosity – always keep asking questions on how you can improve. These will drive the innovative thinking that will push your people data into new niches and uses you weren’t previously aware of. To successfully accomplish this, you need to pair accurate people analytics that scale across your entire business with an employee engagement onboarding resource guide to show you how to maximize the data. The key to bridging onboarding and employee engagement is to build an ultimate data-based engagement strategy. Look at your employee feedback, your engagement surveys, and the pulse of your workforce. What is your people data saying about your current engagement process? Conduct routine check-ins with managers and key team members involved in the onboarding process. This action item is crucial because it enables you to assess how the new employee is performing and what can be done to enhance their development. One thing to note: by “check-ins” we don’t mean hovering over employees like a helicopter parent. No employee enjoys the feeling of being consistently monitored. Make the check-ins a meeting to re-inspire and rekindle goal setting strategies with fun activities! Optimize your onboarding with your existing people analytics process. Learning and development programs already draw from employee feedback, translating them to onboarding is a simple lateral move to analyze how your new hires can also benefit from the engagement change. Incorporate game-based activities like trivia to boost learning success. Almost 80% of the learners say that they would be more productive if their institution or work was more game-like. 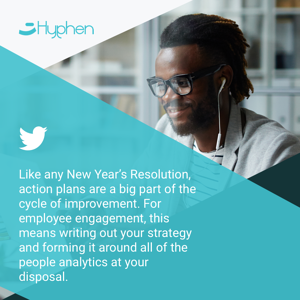 At Hyphen, we help you maximize your employee engagement by enabling you to leverage your most valuable asset: your people analytics. The tremendous insights offered by employee feedback create opportunities to form powerful strategies that build a unique competitive advantage for your workforce. It’s our mission to work with you to unlock the full potential of your data-based engagement strategies. Use data-driven tools to find actionable insights your process is missing– Download HR's Ultimate Guide to People Analytics!